KUALA LUMPUR (Nov 3): Foreign investors bought RM460 million in million equity last week, the fifth highest in a week this year, compared to selling RM351 million the week before, according to MIDF Research. 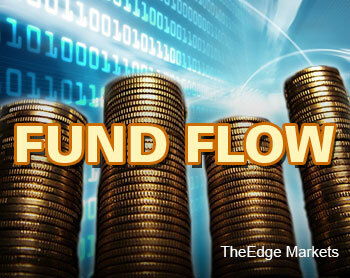 In his weekly fund flow report Monday, MIDF Research head Zulkifli Hamzah said that for Malaysia, foreign money ﬂow had been erratic this year. He said the frequency of the cycles had been higher than many of its Asian counterparts. He explained that there had been a pronounced downcycle, or money outﬂow, in September and in the ﬁrst three weeks of October. “However, the tide appears to be reversing, based on the numbers last week,” he said. Zulkifli said foreign investors were net sellers last Monday, but turned strong buyers for the rest of the week. He said buying peaked on Wednesday when foreign funds mopped up RM202.3 million, only the 15th day this year that net purchase had exceeded RM200million. He said for the month of October, foreign funds sold RM493.3 million, signiﬁcantly lower than the RM1,492.9 million ofﬂoaded in September. He added that for the year until October, the outﬂow of foreign funds had amounted RM3.69 billion, reversing the RM3.03 billion inﬂow last year. Zulkifli said foreign participation eased slightly after three weeks of “elevated” (more than RM1 billion) volume. He said the daily average gross purchase and sale fell below RM1 billion to RM967 million. “Local investors cleared positions, taking advantage of foreign entry. Retail investors sold RM107.9 million while local institutions ofﬂoaded RM352.1 million respectively. “Institutional participation rate bounced back to above RM2 billion at RM2.3 billion, while retail participation climbed slightly to RM867 million. However, we note that retail participation surged to RM1.2 billion on Friday, the highest since August 21,” he said. Commenting on the region, Zulkifli said the world’s equity markets “exploded” in the last week of October, with many bourses recording their best weekly gain for the year. He said that until Thursday, the main story for the week was the Fed’s Federal Open Market Committee meeting on Wednesday. He said that on Friday, the Bank of Japan (BOJ) surprised all by upsizing its monetary stimulus. Zulkifli said the market also received a double boost when the Government Pension Investment Fund officially confirmed news that it will double its investment in shares. “It is apparent that Abenomics is stealing the show and sparking a rally in global equity. “The BOJ’s announcement could be a game changer for global equity in this short term. It partly neutralises the risks of a “hollowing out” effect caused by the expiry of the Fed’s QE3,” he said. Zulkifli said the equity market also appeared to have learnt to live with a new, lower level of oil price. He said crude oil price fell again last week but equity prices absorbed the decline well, in contrast to the near hysterical response a few weeks ago.